It is very unfortunate that most people are scared of snakes. Perhaps the snake is maligned as a result of negative connotations. For example, we read in Genesis that Adam and Eve were tempted to do evil by a “crafty” snake. Similarly there are pejorative expressions such as “a snake in the grass” and “speaking with a forked tongue” that give the impression that snakes are intrinsically untrustworthy and evil. The fact that snakes can cause death doesn’t help to push them up the popularity ladder. I have a problem with our local gardening and housekeeping staff at the lodges. If they find a snake their immediate reaction is to try to kill it. I really struggle to tolerate this attitude ! Snakes serve an extremely useful purpose in that they keep the number of rodents in check. Having said this, we try to educate all our guests about snakes by advising them that human beings are not snakes’ natural prey. At the treehouses at Marcs there are gaps in the reed walls through which snakes may enter. What needs to be understood is that as soon as a snake becomes aware of the presence of humans, it will go out the way it came in, probably a lot more quickly. The treehouses are therefore far safer than the chalets. If a snake enters a chalet (perhaps the front door was left open) and then, upon sensing a human, tries to get out and is unsuccessful, it can become dangerous. This is why our staff check all chalets daily just before the arrival of our guests. The Black Mamba and Spitting Cobra become a problem in a chalet only once they have tried to get away and are unable to do so. The Puffadder is far more likely to cause damage as it is very sluggish and therefore cannot get away as quickly as other snakes. That is why our rangers advise guests on Bush Walks to walk in single file. I took this photo of a Boomslang while at Tshukudu Lodge earlier in February. (I have posted it on http://www.facebook.com/vivasafaris). 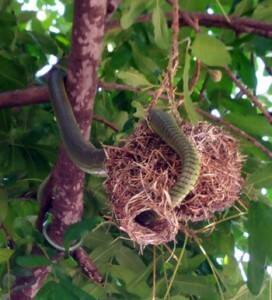 The Boomslang entered a Masked Weaver nest and struggled for over 15 minutes to extricate itself. I could not understand why it was taking so long – eventually we found out. It had caught a Diederik’s Cuckoo chick which is significantly larger than Weaver chicks. This species of Cuckoo parasitizes the Masked Weaver by laying its eggs in the Weaver nest. 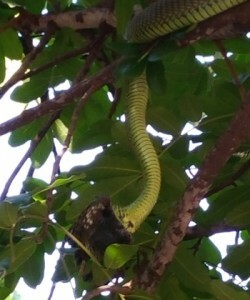 The Boomslang, once it had the young Cuckoo in its mouth, was unwilling (perhaps unable?) to let go and struggled to get the bird out. I assume the Cuckoo chick was in a bridged position. It is very interesting how some animals hold on desperately to their food. I once saw a Vervet Monkey grab hold of an orange through a small hole in a fence through which the orange could not fit. It refused to let go – probably it thought that the orange was now a part of itself – and was eventually caught (and released) by one of our rangers. I wonder if the Boomslang had the same problem. If any of my learned herpetologist friends can shed light on this, please let me know. This month has been very hot and dry. We have had far less rain compared with the previous years. Most of the dams are almost dry and the vegetation is very dry. We are still hoping for rain. The animals are starting to congregate at water holes and dams to drink. This is good for us as guides because it is easy to find animals but for the nature it is not ok. Elephants are everywhere because of Marula fruits. I guarantee to show the guests elephants during marula season as I know exactly where to go and look for them. I received an email from Texas from previous volunteers asking me to visit an orphanage home and get the shoes sizes for the children. Mr Trevor Zeegers, our operations manager, went to the Toughees factory and Mr John Hosea paid immediately for 125 pairs of shoes. I handed over the shoes to the children on 20 February. The shoes were donated by Judy Gaithe, Catherine Lauterbach, Barbara Maberry, Garry Maberry, Michelle Sedas, Dolores Hermon, Lew Harmon, John Hosea and Linda Hosea. This entire group of people has been here before and helped children by buying them some clothes and food. I say thank you on behalf of the children and community for your kindness. God bless everyone who donated to these kids and gave them a happier life. 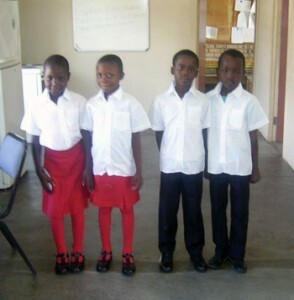 4 of the 125 lucky scholars with their brand new shoes. On 27 February it was very early in the morning when we left Tremisana Lodge and the guests were very happy about going out early. Along Marula road we spotted a herd of buffalos sleeping on the road. We stopped and looked at them as the sun was rising – it was an awesome sighting. While we were enjoying the sunrise we heard lions roaring up ahead of us. I drove through the herd to get to the lions who were around the corner sleeping on the road. It often happens that the lion pride moves after the buffalo herd and picks off the old and young as the opportunity arises. This month has surely had its surprises with animals and exciting things around almost every corner, with me doing a fair number of Kruger safaris this month the sightings have been rolling in left right and centre. The rains this year have been scarce and so that means the bush is back to being dry and the main dams are the places to be for all the animals with many of our large friends making their way there to drink and cool off. The temperature is still high – well into the late 30’s so animals enjoy the waterholes. The weather report said it would be overcast and I had a feeling that the animal sightings would be just as nice as the weather so my guests and I set off on our adventure. It wasn’t long before we had our first sighting – a beautiful breeding herd of buffalo wallowing in the mud pans nearby then crossing the road to graze on the sweet grass on the other side. Soon afterwards a bull elephant wandered across the road in front of us. We were greeted later on by another breeding herd of buffalo which for me was amazing as we don’t always get to see the breeding herds so close to the road. We were all hungry so we headed to lunch for a break and I hoped to get a few updates as the other guides came in as well. I wanted sightings of lion and rhino. After lunch the guests and I set off driving straight to the area of the rhino and were saddened when we got there to find it looked like a rock with a horn from about 100m away which wouldn’t cut it for me at least not today so we pressed on to the next rhino update and as we got there the behemoth stood up and gave us a fantastic show, then right as we were about to leave almost as if he knew he started walking straight to the road so I assured my guests that he would cross if we were patient and about 20 minutes passed and he was right next to the road close enough to count the wrinkles in his skin and then he came up onto the road in clear sight and right on the road, it was a brilliant sighting as we were the only car there for the entire sighting which made it all the more special. So now with 3 in the bag we set off for the lions zooming through all the roads to get to the picnic site where they were said to be lazing around in the river bed. There in the river bed were 12 lions, perfect view of them and safe enough to be on foot for the whole thing as they were viewed from the picnic site! We sat there watching them for a while – they lifted their heads and peered at us from a distance. After all these fantastic sightings, time had crept away from us and so it was time to make for the exit and along the way we got a few more elephant and buffalo. Throughout February, I found myself spending time at the Wildlife Rehabilitation Centre and our neighbouring Private Game Reserve. This centre was established in 1991 by Brian Jones and his family. This facility was set up to help aid animals that had been injured due to human conflict and rehabilitate these animals so they can then be returned to the wild. Sooner than expected animals were being brought to the centre orphaned and needing help and his reputation for helping these animals began to spread. The facility was becoming bigger, and through means of donations, Public Tours and volunteer/student programs, the centre was able to build funds to really make a difference for the wild animals. The centre has developed tremendously over the years and the educational tours have grown in attendance. 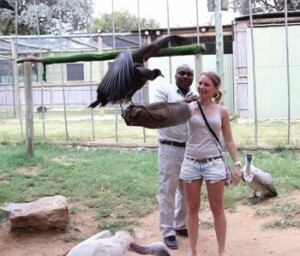 In some cases the Wildlife Centre cannot always rehabilitate an animal back into the wild due to the extent of its injuries, where the animal is unable to hunt, fly, see, run etc. These animals now serve as ambassadors for African wildlife, to help educate the public and change negative mentalities to relocate rather than to injure or kill. In cases such as this the centre has set up a sanctuary to house these animals and has also expanded and introduced breeding programs for these endangered species. At Viva Safaris we enjoy taking our guests on the Public Tour, as the centre will stimulate awareness and an understanding of the difficulties faced by our wildlife today. They will get to see the different stages of rehabilitation of different animals, and where possible they will get to interact with ambassadors of African Wildlife. Guests will get to interact with Jolly and Juba the resident cheetahs; meet the lions rescued from an Egyptian Circus and Chui the Leopard. Other animals you will see at the centre include Vultures, Eagles, Wild Dog, Honey Badger, Hyena, Serval and Caracal. Viva Safaris guests very much enjoy the tour of the centre. The staff are extremely passionate and very dedicated towards the rehabilitation and protection of wildlife, and really make the tour very enjoyable and interesting. Following the Rehabilitation Centre we take our guests to a neighbouring closed system Big Five game farm, meaning the property is completely fenced. Here at Tshukudu many animals are brought and once rehabilitated can live in the wild again. One recent drive in particular made for a very enjoyable afternoon. We set off for Heart Shaped dam and on the way we came across 2 White Rhinos wallowing in the mud in the hot afternoon sun. We sat with them for 20 mins just watching them enjoying their mud bath and drinking water. We drove around the corner to the dam where we saw a male and female lion seeking shade and digesting their full bellies. Then the lions suddenly became alert and looked in the opposite direction, and out from the bushes emerged the small family of elephants. They also came to drink at the water hole. They played in the mud, sprayed water all over themselves and took a needed drink. In the dam itself, a hippo was a little put out by all the splashing and wallowing by the elephants. We parked our vehicle on the dam wall and pulled out the cooler box and enjoyed some sundowners and snacks whilst watching all these animals. During the evening the lions also came out from the shade and came to drink by the water’s edge. We remained at the waterhole for over an hour and a half just marvelling at this amazing sighting of Rhino, Lion, Elephant, Hippo, Crocodiles, and not to mention all the beautiful water birds. Possibly one of the best drives I have had at Tshukudu. The morning walks have been enjoyed by both staff and guests. Our guests are fortunate that these walks are not a simple “Nature Walk” as offered by some inferior safari companies but are the real deal – we are walking in Big Five terrain and we search for and see them! Guests are always eager to learn about the bush, and I love sharing my knowledge. This month has been a great month for the big cats, as we have had two separate lion kills on Olifants West Reserve. The first kill was at Zulwini : three lionesses, one big male and 6 adorable cubs. They killed a large Kudu, and fed there for two days. This was a great sighting as we could go back several times. The next kill was a Waterbuck, which was right by the road, and the guests were able to witness this from close by. The other big cat sightings were a Cheetah on Marula road, and a quick sighting of Leopard. 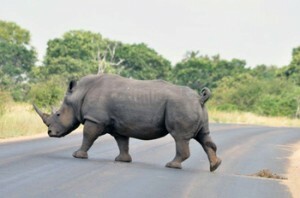 One of the more exciting mornings, my guests and I were charged by Zulu, our resident Black Rhino bull. We were just getting out of the Landcruiser when I spotted 3 black rhino about 300 metres away from us. I quietened my guests, and we slowly approached to get some good photos. The bull came slowly towards us, until we were about 150 metres apart when he began to charge. I was able to get everybody calmly into the Landcruiser, unharmed and excited. I then started the vehicle and the rhino backed off. We then drove onwards and continued our walk along the Olifants River, looking for better behaved pachyderms like hippo and elephant. We also witnessed a crocodile kill an impala at the Ngwenya dam. It was really special and my fortunate guests were ecstatic ! I have also seen our two big bull elephants around Tremisana. Zulwini and Sheshangani have been away for a couple of months and it is good to have them back again. One group of guests were extremely excited to be able to get close to a herd of buffalo. We were literally surrounded by the herd and I switched off the engine and we waited, mesmerised, as the herd slowly and calmly made its way past the Landcruiser really close by. LUKE GETS THIS MONTH’S PROCRASTINATOR AWARD – well done on your first time ! A sighting is always great when one of the Big Five is present, BUT when you have three together simultaneously, then it becomes an amazing sighting. My guests and I were fortunate enough to experience one of these amazing sightings in the Kruger this month. The day started off a bit quietly and the temperatures were very high. I was a bit worried that this was going to be a very quiet day. The midday heat slowly began to dwindle, giving rise to a lot more activity. The big herds of elephants began to move across the open plains, heading for the water holes. The lions still hadn’t graced us with their presence, but soon that would all change. We had arrived at Ngotso dam, a large stretch of water. The first thing we spotted was a White Rhino, happily wallowing in the mud. The other side of the dam happened to be full of elephants that were swimming about in the shallows, with only their trunks sticking out the water, like a snorkel. We sat watching both the rhino and the elephants. It was when the rhino suddenly stood up that we noticed the unmistakable shape of a lion. The lion had appeared from the shade of a small tree, headed straight past the rhino, and down to the water for a drink. My guests were amazed at how lucky we were, and how large the lion was. Great sighting. The leopard has got to be one of the most beautiful cats, and always a thrill to see, even if it’s just a glimpse, as it runs past. We had been on a roll this particular day, with most of the boxes ticked. The leopard was the only member of the Big Five still outstanding. I had received an update during the lunch break – a leopard had been sighted. We heard it was resting in the fork of a tree, which meant it would probably still be there resting during the heat of the day. We headed off to investigate. As we drew closer we noticed one lonely car, stopped on the side of the road, the occupants peering into the tree beside them. 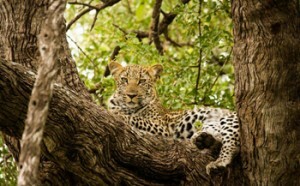 We crept closer and there in the tree beside us, was a beautiful leopard. What a beauty – chilling in a tree! The day thus ended brilliantly, such an amazing sighting and so close to the road. Wow ! TREMISANA GAME LODGE is in need of some good rain ! We have a very advanced spray system that uses water from the borehole. However this borehole water contains various chemicals including carbonates and silicates ( I won’t readily drink it ) that are nowhere near as good for plant growth as the dissolved nitrogen in rain drops. What brings me joy each and every morning is waking up to the sounds of the birds and the Vervet monkeys jumping on my roof. What a blessing to have breakfast while seeing the warthogs and the occasional giraffe come to the watering hole. We are still waiting for the rains and sadly it seems like it’s going to be a long wait. Maybe a rain dance is the answer ! Our GM, Piero, offered to buy me and the 3 interns special yellow polka dot bikinis to wear for the rain dance but we modestly declined – he is now blaming us for prolonging the drought ! 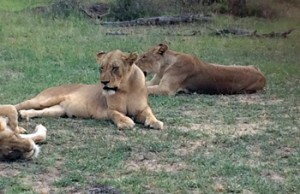 In terms of animal sightings at the lodge my best this month was of two lionesses. Just after dinner I got a call that there were lions just outside the lodge. Together with very excited guests, we went near the gate and saw two lionesses on the hunt for impala. I was excited and at the same time a bit scared. I am sure the guests I was with felt the same way. The lionesses did not stay too long and continued following the impala. This, in my book, was one of the best nights at Tremisana Lodge in February. 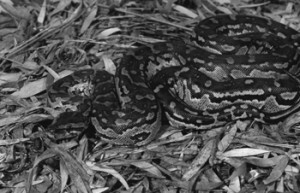 I have a serious phobia of snakes and for one living in the bush I have learnt to accept their existence and simply stay away. Just before dinner time one night I went to the Boma to switch on the lights. I saw what looked like a log and almost stepped on it. To my horror the log moved !!! I ran for dear life. I came back after a minute or two and switched on the lights. I had almost stepped on a rock python. I started laughing with the staff about the way I had screamed. Believe me – it had really looked far bigger in the dark. We are still continuing with our student internship program and this month has seen us welcome three students (the 3 K’s – Kimberly, Kiara and Kayleigh) from the International Hotel School of hospitality. We look forward to working with the students and teaching them more about the hospitality industry. RONALD reports as follows : A herd of Blue Wildebeest has moved into our area and is seen every day drinking at the Breakfast dam and along the river. With the shortage of rain, we are very fortunate that the Klaserie River is a perennial river. There has been a great concentration of Impala, Kudu, Waterbuck, Buffalo, Zebra, Warthog and Giraffe joining the ever-present herds of Nyala. We are also hearing Hyena more often at night and see their footprints all over the place. The Wild Dog pack seems to have moved off and the Nyala seem a lot more relaxed. At Marcs Adventure Camp, we have been upgrading all units as the camp will be hired out from next month. At the Treehouse Lodge, we are busy with creosoting the many wooden ballustrades and all the viewing decks of the treehouses. Our webmaster, Marco, is thrilled that in one month our Facebook page has had over 4000 likes. Thanks to the guides, particularly Vanessa and Luke, for sharing your experiences by posting superb photos and comments. After almost 4 years with us, Wesley, accompanied by his new girlfriend, has decided to move on to another Lodge. We thank him for all he has done. I recall his very first game drive. He was only 19 at the time. He got as far as Nonwane and then called me saying he had lost confidence. I sent another guide to carry on with the drive and Wes came back shattered. I remember working through the situation with him and, from the next day, he was on the way to becoming the exceptional guide that he now is. He will be missed, especially by the kitchen staff ! We wish him well. We have two new interns, Kayleigh and Kiara, who, like Kimberly, are doing their courses through the International Hotel School in Durban. I received a note from their practical coordinator, Janine Dixon, indicating that this Hotel school has been voted as one of the best 30 Hotel Schools in the world !! I am pleased to know that Viva Safaris is associated with such a prestigious academy. I have meant to review Tremisana and Mark’s Treehouse Lodge since my experience there in September of 2013. The lodging staff, owner, manager (Bongani), safari drivers and trackers did a great job. I was greeted by Bongani and given a private ride to Balule reserve when I transferred from my other Safari experience based out of Skukuza Rest Camp. Bongani went above and beyond the call of duty to ensure I had everything I needed to enjoy my stay and checked with me periodically to check on my experience at the lodges. The accommodations were excellent for the price paid and meals were satisfying and well done. I was with Tremisana and Mark’s Treehouse lodge for about 8 days. The owner contacted me personally numerous times over my stay to ensure that I was satisfied with the activities and lodging. I was given the flexibility to tailor my safari experience and participate in available activities that suited my wishes and schedule. This level of attention and flexibility should not be expected by all visitors as I understand I was staying with them for much longer than most people on Safari and they wanted to ensure that I could participate in my preferred activities. I even had enough time to spend a day by the pool at Tremisana. The safari schedule involves early pre- dawn starts and some night drives so setting aside a day to chill by the pool was appreciated. Rye managed the lodge and made sure that special meals were available when I was the only person who stayed at the lodge for the day. At Mark’s Treehouse Lodge, the tall treehouse that I stayed in had a great bathroom down at ground level that provides a great open- air star gazing experience for night showers! The outdoor shower certainly added to the ambience and experience. Both properties are as expected for the price, with Tremisana being more comfortable and with great character while Mark’s Treehouse Lodge has spectacular rustic character that is most likely comfortable enough for most fussy travelers (at least those with a penchant for luxury camping type accommodations). I had a wonderful 4 day/3night safari at Tremisana Game Lodge. 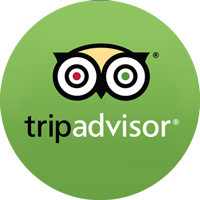 The staff could not have been more helpful, and the guides were exceptional. In total, I did five expeditions out from the Lodge during my stay and they were all great experiences, allowing me to see and photograph almost all of the Big 5 and many other animals as well. The pick-up from and delivery back to Johannesburg Airport was smooth and trouble-free. We stayed in on of the pre set up tents which had there own power supply lights and set up beds which on the whole were very comfortable, toilets and showers were less en 10 meters away and were very clean ignoring the odd spiders web or frog. However considering you were “in the bush” this was not an issue. The social areas ( bar, food areas and pool) were very nice and having dinner sitting around the campfire was great and breakfast on the lake was perfect. The staff were very helpful and made everything clear for your next day’s activities. The big win for this location was the free movement of animals many moe info we walked passed Kudu to get to breakfast amongst others, it really made the location so much more then a glamping site with tree houses. I stayed here in November this year, the staff were so friendly and helpful and my tree house No 2 was so amazing, I wish I had had a bit more time to spend in and around the camp I was staying for 5 nights and every day was full to the brim with visits to Kruger & private game reserves which was fantastic but when it came time to leave I wished I could have spent just one afternoon sitting on my balcony, glass of wine in hand and watched the world go by, still maybe next time. I will most certainly return. Good value for money.